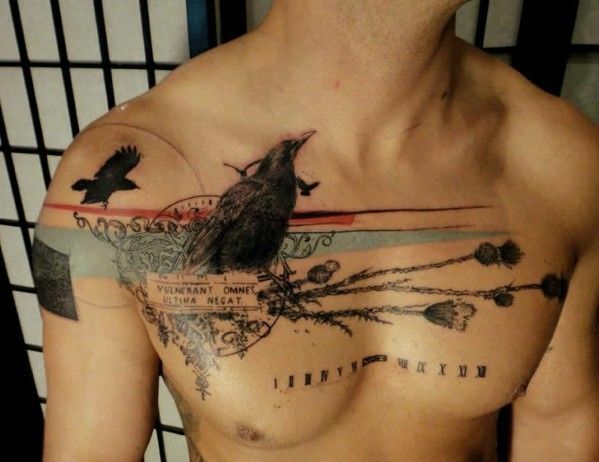 This design is a great example of how a chest tattoo can so fluidly transition into an arm tattoo. Intricate shapes combined with swirling text keep on theme with the overall design. 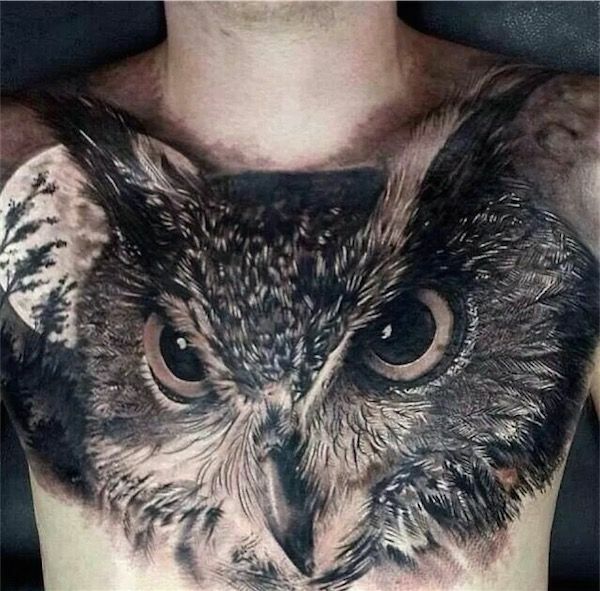 Using the chest like a giant canvas, this enlarged image of a an owl, with a full moon in the backdrop doesn’t seem to take the body’s natural shape into consideration. This tattoo is clearly about how realistic the image is. The hawk is the centerpiece tattoo, totally isolated from the other designs on this model’s body. This sort of separation allows the design to be appreciated on its own and symbolize what it wants. This design accomplishes three images without using a triangular design and still manages to flow with the body’s natural curves. 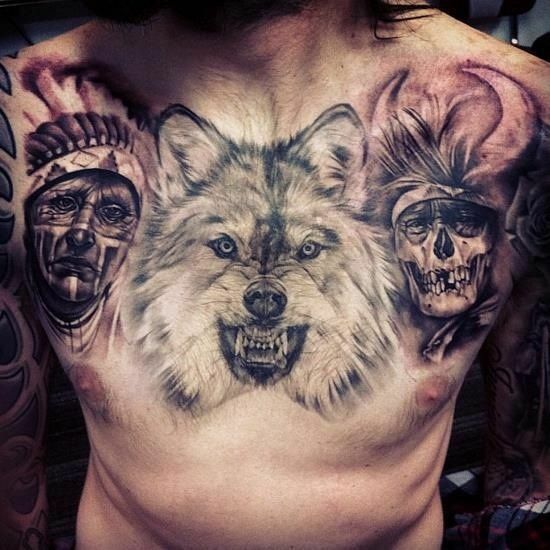 The center image of the wolf is rather large and pushes the images of the Native Americans to the sides of the pectorals. The banner held by winged gerbils reach up to the shoulders without actually reaching it. The shoulders are bare which accentuates the chest design all the more. The cat skull and floral motif make a morbid image surprisingly beautiful. 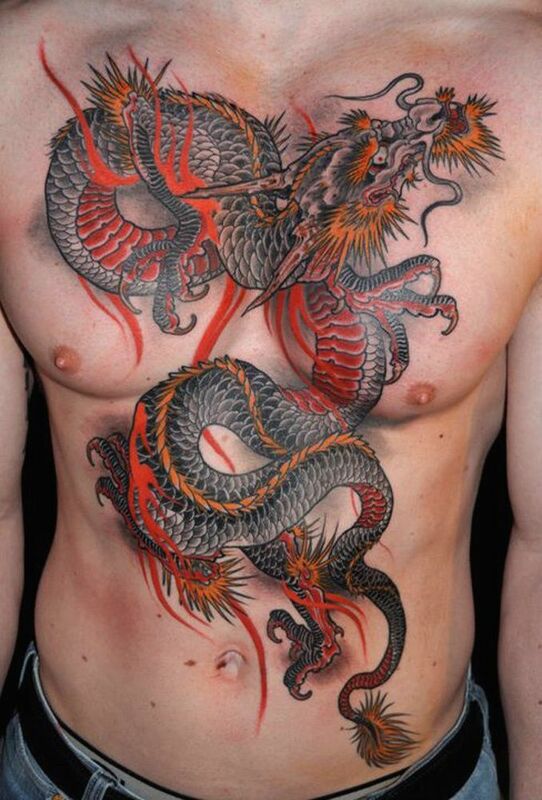 Full frontal dragon tattoo done in black, grey, red and orange. In exquisite detail, this is a death defying smooth and beautiful work of art. His claws are extending to grab onto you and his terror is besieged by a plumed tail. Shoulder to shoulder stags in full combat. The stag is requisite to the fight to determine who has the greater strength and will be imbued with dominion over the herd. 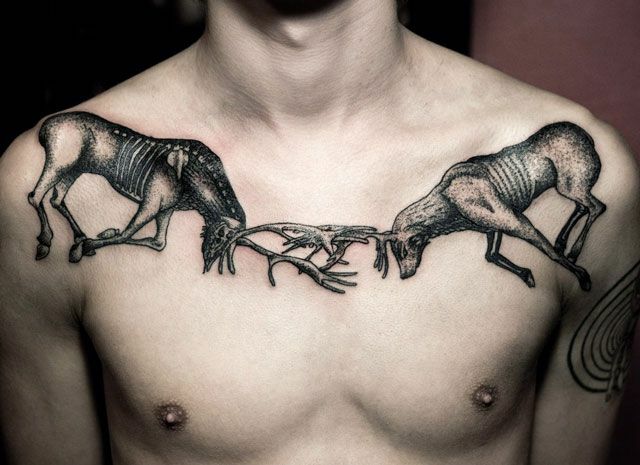 The strongest stag will rear endless offspring with multiple mates to populate in his honor. The cogs and gears of the heart. 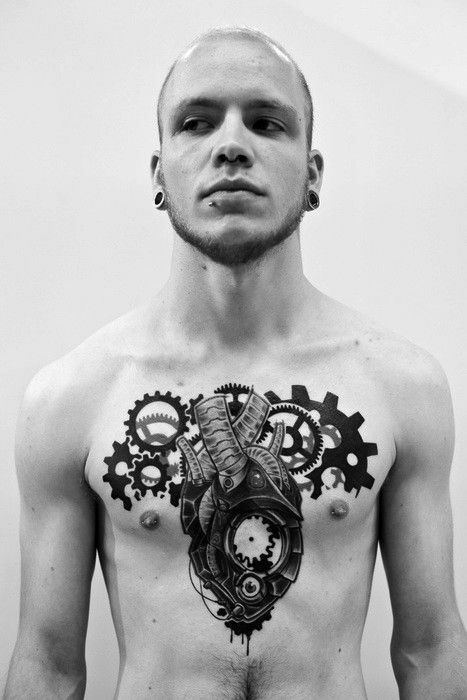 Centered for full appreciation, this one of many tattoo ideas combines the bloody heart of man with the automaticity of his function. It is in his mechanical nature he suppresses emotion to meet life’s requirements. Splash of destiny. There is so much color, detail and meticulous work in this double full sleeve top of the chest men’s tattoo. He is smoldering in splashing waters, eagle feathers, and a descending anchor of truth that leads to a peculiar mustached and bow tied man at the lower side. They all wound, and the last kills. In reference to time, the black bird awaits his prey. 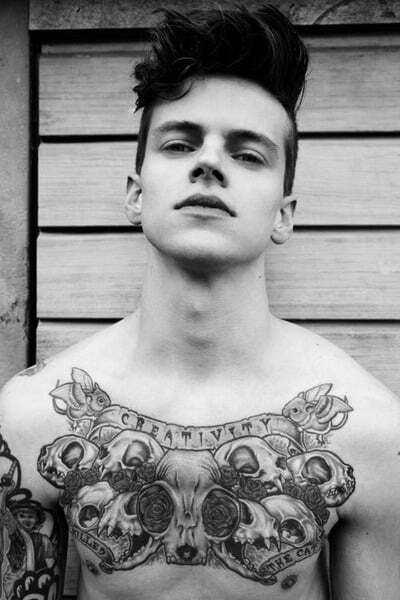 This masculine tattoo idea is infused with irony with a subliminal time line that no one can outrun. Wrapped around one shoulder and growing across the chest, there is color and intricacy that calls to your endless impatience.